T-R PHOTO BY THORN COMPTON - Gladbrook-Reinbeck senior Meriah Wittgreve (16) hoists the state-qualifier trophy while surrounded by her teammates after the Rebels’ fell to Janesville in the opening round of the Iowa Girls High School State Volleyball Tournament on Wednesday at the U.S. Cellular Center in Cedar Rapids. 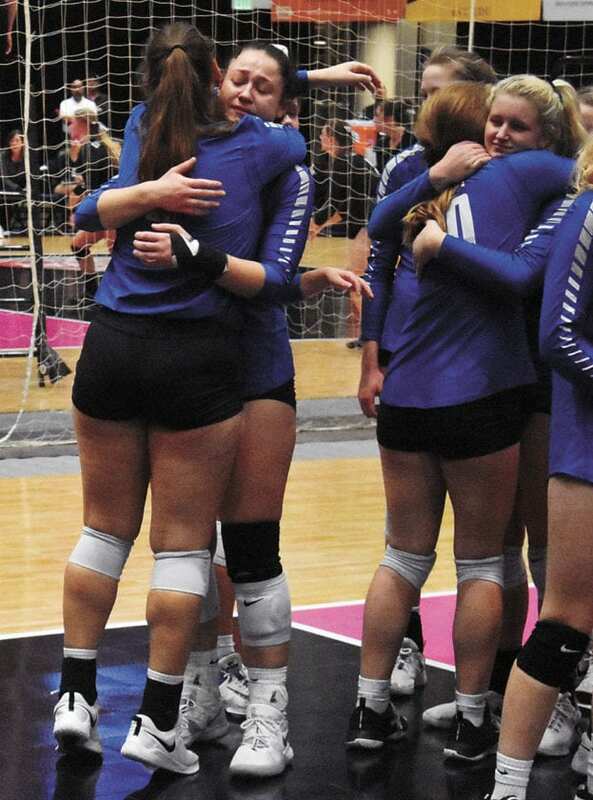 CEDAR RAPIDS — When the final point was scored and the Gladbrook-Reinbeck volleyball team’s season came to an end on Wednesday with a loss to Janesville in the opening round of the Iowa Girls High School State Volleyball Tournament, there were few tears shed by the defeated girls. 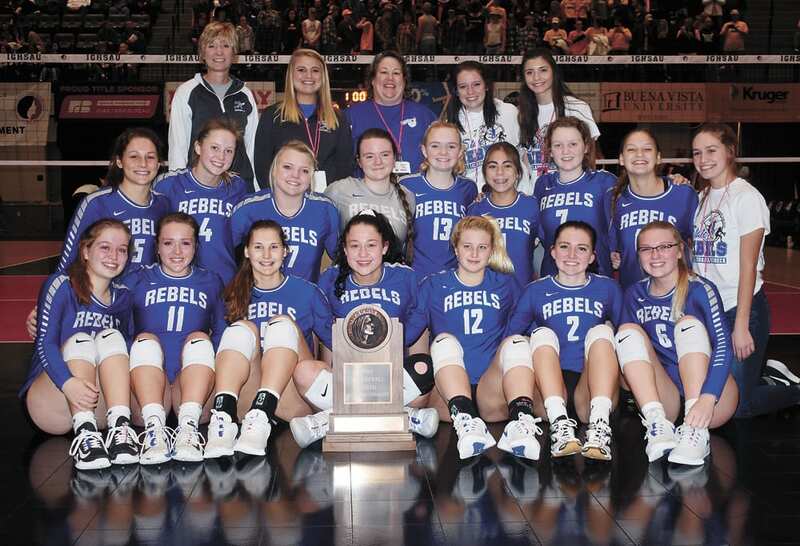 Instead, the Rebels congratulated the three-time defending Class 1A champion Wildcats on a three-set victory, 25-14, 25-21, 25-13, then turned around and celebrated amongst themselves when handed their state-qualifier trophy, the first time G-R brought home a trophy from the volleyball state tournament in 30 years. It wasn’t until after they were handed the trophy that sadness crept upon some of the girls’ faces, mainly on the faces of the seniors who knew this was the last time they would all be together on one volleyball court. 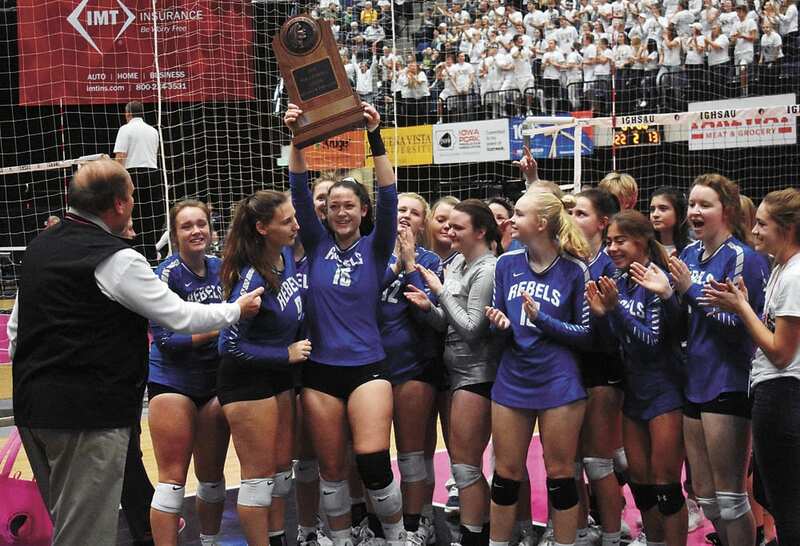 Still, senior Meriah Wittgreve said even though their time with the Rebels was at an end, they all knew what they had done bringing the team back to state for the first time in three decades was truly historic. T-R PHOTO BY THORN COMPTON - Gladbrook-Reinbeck seniors Justina Eggers (6) and Rachael Scarf, right, contest a hit by Janesville senior Bree Thompson, left, during the first set of the Rebels’ loss to the Wildcats in the first round of the Iowa Girls High School State Volleyball Tournament on Wednesday at the U.S. Cellular Center in Cedar Rapids. 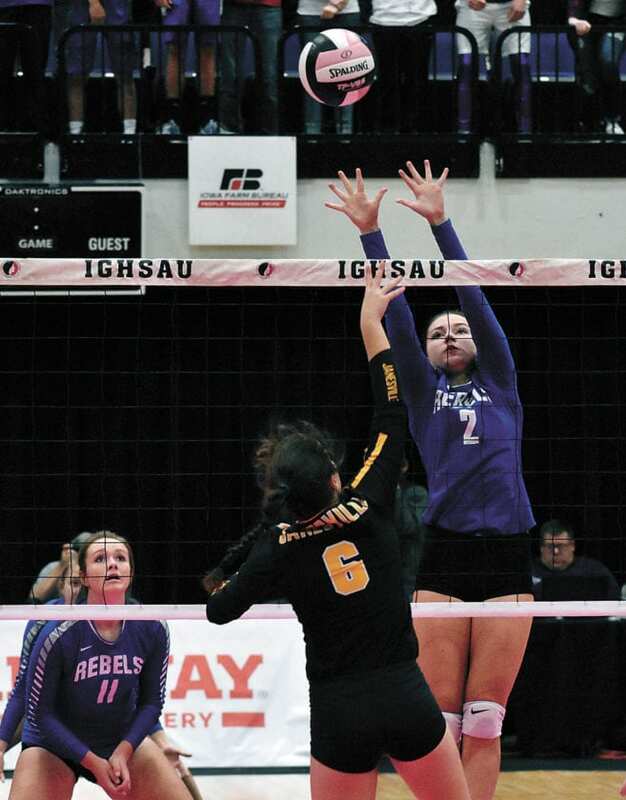 It was always going to be an uphill battle against Janesville (44-5), who hadn’t lost a set at state in it’s last two title runs, but Gladbrook-Reinbeck (28-10) landed blows early and often in the first two sets. The Rebels jumped out with a hot start in the first set, forcing a Wildcat timeout when they took a 5-0 lead, but once G-R was up 8-3, Janesville went on an 8-0 run that kickstarted their offense to a 25-14 win in the opening game. Again the Rebels found themselves up 8-3 in the second set but the Wildcats were able to claw back, but Janesville did just enough to hold on for a 25-21 win in the second. That 25-21 second-game score was the closest first-round set Janesville has played since 2015, and Rebel sophomore Saari Kuehl said even in the loss they showed the state they came to play. T-R PHOTO BY THORN COMPTON - The Gladbrook-Reinbeck volleyball team poses with its state-qualifier trophy after its loss to Janesville in the first round of the Iowa Girls High School State Volleyball Tournament on Wednesday. What plagued G-R throughout all three sets were tiny errors, whether that be a missed pass or a mishandled serve, and against a team like the Wildcats that is enough to do you in. Janesville head coach Shelly Sorensen had to give a similar message to her team after their slow start in the first two sets, but she said their experience is what ultimately lifted them to victory. 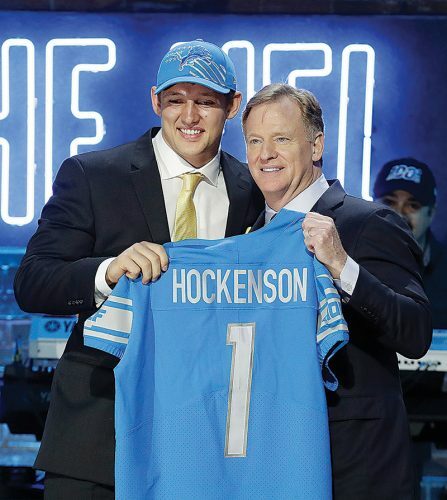 “They just needed to settle down and take care of that first ball, that was the name of the game so we could get our offense running,” Sorensen said. 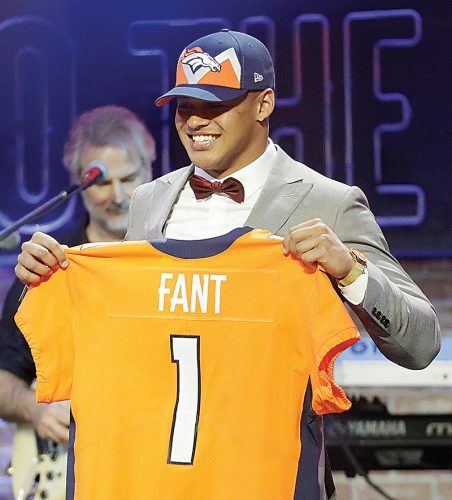 “They had a few little streaks like that throughout the match but we were able to stay composed and settle down, get some good digs and turn it into offense for us. T-R PHOTO BY THORN COMPTON - Gladbrook-Reinbeck seniors Haleigh Berendes and Meriah Wittgreve, left, hug each other while Madison Denny-Weber embraces fellow senior Jada Schlampp, right, after the Rebels were eliminated by Janesville from the state tournament. Wildcat senior Bree Thompson, who will play Division-I volleyball next year at Lipscomb University, finished with a game-high 20 kills. Kuehl nearly matched that number with 17 kills of her own for the 11th-ranked Rebels, but what Kelley said top-rated Janesville was able to do that her girls weren’t was get other players involved. 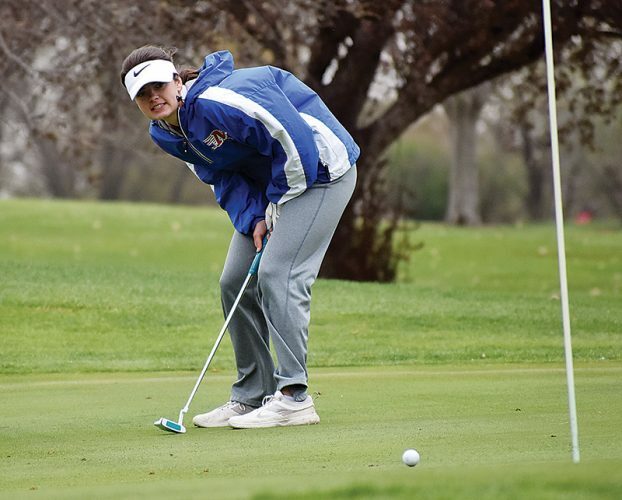 Alisa Bengen had nine kills to place second for the Wildcats and Julia Meister contributed six. Haleigh Berendes was second for the Rebels with four kills, and Wittgreve followed with two. Janesville also had 16 aces in the match, compared to four for G-R. Wittgreve said the crowd noise and the environment contributed to their inability to handle the Wildcat serves at times. Still, down big in the third set and with their season hanging in the balance, many girls like Justina Eggers and Madison Denny-Weber were going all out to save balls, putting their bodies on the line just to keep the ball up and keep the time from running out on their year. Denny-Weber had 20 assists to lead the Rebels, while Alyssa Morgan had nine digs, followed by Denny-Weber with seven and Kuehl with five. Janesville senior Lily Liekweg, who is committed to play at Wichita State University next year, had 20 digs for the Wildcats, and Sorenson said she’s the main reason Kuehl didn’t destroy their back line. No matter the outcome of this game, Kelley said this was still an incredible run for a Gladbrook-Reinbeck team that wasn’t on anyone’s radar as a state contender to start the year. Wittgreve said not even just this season, but the last two seasons playing under Kelley — both of which were 20-win years after going without a winning record in the last five years — was an unbelievable experience. Denny-Weber agreed with her fellow senior, saying she will remember this season and the support from the community for the rest of her life. The Rebels will have to find a way to replace the seven seniors — Wittgreve, Denny-Weber, Eggers, Berendes, Rachael Scarf, Rachel Cooley and Jada Schlampp — and Kelley said it will take more than their on-court ability. Luckily there are two great pillars to build around in Kuehl, who finishes the year second in kills behind Janesville’s Thompson, and Morgan, a libero who is still coming into her own defensively. Kuehl said if she has anything to say about it, it won’t be another 30 years until Gladbrook-Reinbeck is back in the state tournament. 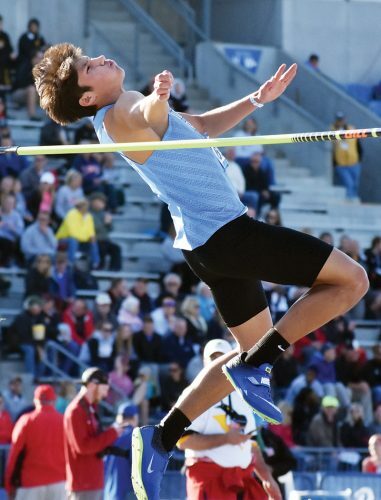 Cedar Falls (45-0) vs. Linn-Mar (32-9), 10 a.m.
Ankeny Centennial (39-3) vs. West Des Moines Valley (41-3), 10 a.m.
Osage (30-6) vs. Kuemper Catholic (43-1), 2 p.m.
Tipton (38-3) vs. Mount Vernon (28-15), 2 p.m.
Dyersville Beckman (44-3) vs. Unity Christian (31-6), 4 p.m.
Western Christian (40-5) vs. Sidney (39-2), 4 p.m.
Janesville (44-5) vs. Tripoli (24-15), 6 p.m. Le Mars Gehlen Catholic (28-4) vs. Holy Trinity Catholic (36-3), 6 p.m.
T-R PHOTO BY THORN COMPTON – Gladbrook-Reinbeck seniors Justina Eggers (6) and Rachael Scarf, right, contest a hit by Janesville senior Bree Thompson, left, during the first set of the Rebels’ loss to the Wildcats in the first round of the Iowa Girls High School State Volleyball Tournament on Wednesday at the U.S. Cellular Center in Cedar Rapids. T-R PHOTO BY THORN COMPTON – Gladbrook-Reinbeck seniors Haleigh Berendes and Meriah Wittgreve, left, hug each other while Madison Denny-Weber embraces fellow senior Jada Schlampp, right, after the Rebels were eliminated by Janesville from the state tournament. T-R PHOTO BY THORN COMPTON – The Gladbrook-Reinbeck volleyball team poses with its state-qualifier trophy after its loss to Janesville in the first round of the Iowa Girls High School State Volleyball Tournament on Wednesday. T-R PHOTO BY THORN COMPTON – Gladbrook-Reinbeck senior Meriah Wittgreve (16) hoists the state-qualifier trophy while surrounded by her teammates after the Rebels’ fell to Janesville in the opening round of the Iowa Girls High School State Volleyball Tournament on Wednesday at the U.S. Cellular Center in Cedar Rapids.